Rituals have powerful effect on humans. But, according to a new study on the effects of rituals on people in mourning, it doesn't matter what you believe about those rituals. Nor does it matter what specific rituals you do. Yet, it's curious. While believing that a ritual is powerful is not important, according to this study, believing that the ritual is a ritual, and directing it at the feelings of loss, in a sense, seems to matter. First, our pilot study demonstrates that people use a wide variety of rituals, indicating that the particular actions people perform when carrying out rituals are not the primary driver of reduced grief. Second, believing in the effectiveness of rituals did not moderate the relationship between performing rituals and reduced grief, suggesting that people do not need to explicitly endorse the efficacy of rituals in order for rituals to increase perceived control and lower grief after a loss. Finally . . . referring to a set of actions as a ritual and performing such actions are both critical ingredients for rituals to be effective. It's not clear why it should be the case that thinking of a ritual as a ritual would be more efficacious. What counts as a ritual, of course, is open to individual interpretations. When asked about rituals they had used to cope with the death of a loved one, test subjects described a range of practices. One person described the Jewish practice of sitting shiva and a praying particular prayers over the next year. Another described playing a late mother's favorite song, Natalie Cole's "I miss you like crazy," and crying. A third described washing the deceased's car in the way he did. The sampling of rituals wasn't representative enough to say anything definitive about varieties of ritual practice in America today, but it is interesting to note that, among those participating in the test, mourning was not generally a religious act. It was not communal either. There were nearly 250 test subjects, who all volunteered at a Ivy League school. Fewer than 20 percent of them were students, about half male, half female, with a median age of about 36. Among these, only about 5 percent described mourning rituals that were "specifically religious in nature." Only about 5 percent said they'd mourned a loss, a death or an ended relationship, with rituals performed communally. About 10 percent said that, with or without community participation, their rituals were in some sense public. "Most of the rituals recalled," write Norton and Gino, "were private, everyday rituals that were unique to the individual rather than performed publicly." Twenty-one years ago, when federal agents with guns and tanks descended on Mount Carmel, the property of a small, Seventh-day Adventist splinter sect named the Branch Davidians, the leader of the group called the local sheriff's office. He was considered a prophet. Specifically, he thought of himself and was thought by the Branch Davidians as an apocalyptic prophet. They thought at the end of the world he would explain and expound the Bible prophecies of the end of the world. With paramilitary forces surrounding them, it looked a lot like the end of the world at Mount Carmel. Lynch: Let me, can I interrupt you for a minute? Koresh: No, this is life. This is life and death! Lynch: That's what I'm talking about. Koresh: is life and death. In the latest issue of the New Yorker, Malcolm Gladwell explores why government agents couldn't understand the Branch Davidians. The 1993 siege ended in tragedy. It seems, from all the information available after 21 years, that it ended in a tragedy that could have been avoided. But it wasn't. And it wasn't, Gladwell argues pretty convincingly, because government agents on every level could not understand the religious motivations of the Branch Davidians for what they were: religious motivations. That is to say -- though Gladwell doesn't use the word -- secularization. From the 2010 US Religious Census. 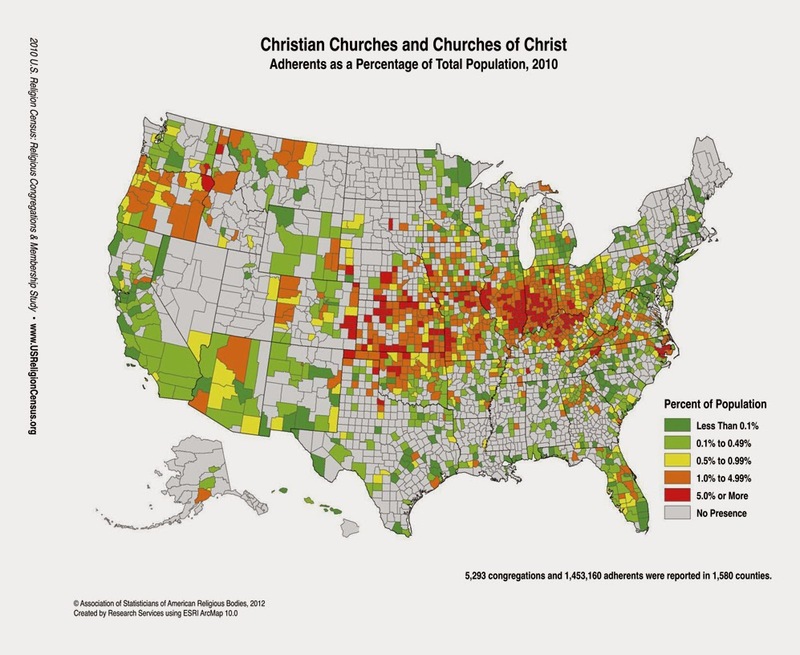 The Restoration Movement churches -- which are only very loosely organized -- had 5,293 U.S. congregations and 1.45 million adherents in 1,580 counties in 2010. The churches were most clustered in a belt from Northern Kentucky (where, notably, the revival that marks the beginning of the movement happened in 1801), through central Indiana and Illinois, and through Missouri and Kansas, parts of Nebraska and Oklahoma, and into Eastern Colorado. They were also well represented in Oregon, parts of Virginia and East Tennessee, Central Florida, and in a southern ring around the City of Atlanta. There were none, apparently, in North Dakota. Justice Alito raised the highest-profile question in the case: Can for-profit corporations make free-exercise claims at all? Or rather, why did the government believe for-profit corporations can't raise such claims? Nota bene (3.26.14): The transcripts of oral arguments in this case are available here. The Supreme Court is scheduled to hear a major religious liberty case in 90 minutes of oral arguments today. In Hobby Lobby vs. Sebilius and Conestoga Wood Specialties vs. Sebilius, the court will decide whether or not for-profit corporations can get religious exemptions to the health care law that mandates employers provide insurance that covers birth control. The case has generated more than a little commentary and culture warring. A lot of people think a lot is at stake in this case. The issues are complicated enough that there are lots of good reasons and plausible arguments, though none so overwhelming as to be as conclusive as partisans might hope. The arguments and analysis have been extensive, not to mention the parts of public discourse that are more passion than information. I've found, however, after reading a lot of that, and reading the legal briefs on these cases, and working through the arguments with some smart students from Heidelberg and Pepperdine universities in two extended workshops, I still have some questions. These aren't arguments, but questions. They go to the heart of the case, it seems to me. Or rather, the hearts, since this beast of an issue surely has more than one circulatory system. They go to the hearts of the matter, then, and yet haven't been answered in the extensive, extensive argumentation about this case. 1. What's the difference between a for-profit corporation and a non-profit corporation? The key question in this case is whether or not for-profit corporations can have religious rights. Since the Citizens United ruling in 2010, the political left has spent a lot of energy attacking this idea that corporations are somehow, legally, persons. The claim that they're not has been pretty politically effective, putting pro-business conservatives in a terribly awkward position. Such is the stuff of politics. Legally, the case isn't quite this clean. Constitutional protections extend to corporations in more than a few cases that aren't controversial (at least in the mainstream of American politics). They have the Fourteenth Amendment right and a Fifth Amendment right to due process under the law. They have the Fifth Amendment protection against double jeopardy and Fourth Amendment protection against unlawful searches and seizures. They have the Sixth and Seventh Amendment rights to a trial by jury. Few seem outraged by these instances; rejecting the legal doctrine of corporate personhood, if one is going to be consistent, would have consequences reaching much further than campaign ad funding. One could perhaps argue that the First Amendment protections of speech and religious exercise are just different. Yet, with regards to this particular case, that's not the argument. The federal government is actually not taking the position that corporations cannot have or exercise religion. They're taking much more limited position that for-profit corporations can't have or exercise religion. Churches and many other religious organizations are, in the eyes of the law, corporations. They're not-for-profit, of course, but still corporations. God's Not Dead, the latest evangelical film to hit theaters, pulled in $8.5 million in ticket sales last weekend. This is impressive, given it was only showing in 780 theaters. Before there was a movie, though, there was a song: The film notably features a song on the soundtrack by the same name, Newboys' "God's Not Dead," from 2011. This is the first song of the Christian group's 15th studio album, which is also called "God's Not Dead." In the music video, people are surprised to see media telling them authoritatively that there is no God. They then respond with a social media campaign, blogging, tweeting, publishing and singing that God's not dead, "he's living on the inside/he's roaring like a lion." The set-up is not dissimilar to the set-up for the film. However, that 2011 song is not the first time that set-up has been the source of a song. Before there was that song, there were some others. I want to tell you what the paper said. Had been a-teachin' that God was dead. from back in in Elijah's time. I can see where God left his sign. Fred Phelps, Sr., who lead a small religious group dedicated to declaring God's judgement by picketing funerals, has died at 84. Phelps founded his independent Baptist church in Topeka, Kansas in 1955, but only rose to national prominence in the 1990s, picketing at the funerals of AIDS victims. In 1998, Phelps led his followers in a protest at the funeral of Matthew Shepherd, a gay university student whose brutal death inspired hate crime legislation. The church, Westboro Baptist Church, used the occasion to proclaim its message, "God Hates Fags." Phelps said it was simple: "the sodomites have taken over the country, and this country has given itself over to immorality. We want to warn the nation, let them know that God is not going to let this country get by with that kind of degeneracy." In the 2000s, Phelps' profile was raised further when the church protested or tried to protest at the funerals of soldiers who had been killed fighting in Iraq, declaring that God was punishing America for its tolerance. According to the 2007 documentary Fall from Grace, the church was spending about $200,000 per year traveling to protests around the country. On news of his death, the Topeka-Capitol Journal described Phelps as "vitriolic, outspoken and reviled," and noted he would likely be remembered for his "willingness to hate." Westboro said their founder should rather be remembered as one who "preached a plain faithful doctrine to an ever darkening world." Phelps and his church were often described in news reports as "controversial." This was not really true, however. Phelps was perhaps the least controversial religious leader in America. Everyone opposed him. Astrophysicist Neil deGrasse Tyson says that he is unconvinced "by any claims anyone has ever made" about the existence of divine power. Yet, he doesn't call himself an atheist. In this, it turns out, he's not unique. It's possible to articulate subtle differences between these identifications. Atheists can be thought of as differing from agnostics on the question of the strength of a negative claim and/or the rules of evidence for such claims. "Nones" -- not to be conflated with the larger category of "nones," many of whom do believe in a God -- can be conceived of as differing on the question of the importance of the question. The other identifies can be thought of as religious identities that don't involve belief in a divine, or as the identities of individuals who affiliate with believers even while they themselves do not believe. 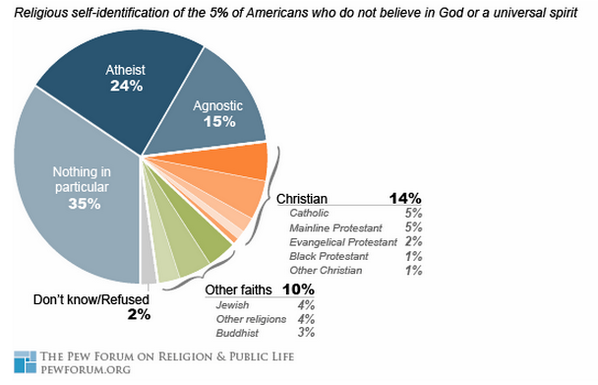 It does raise the question, though: To what extent are atheists, as a movement, not even trying to get theists to stop believing, but just attempting to push and persuade 76 percent of those who don't believe in a God to identify as atheists? Ganshert has herself authored three works of evangelical fiction, published by WaterBrook. and I forget what it was I was supposed to say. Living in a country where you don't know the language means you have a great excuse for not talking to Jehovah's Witnesses. To be completely honest, I actually did understand the two Witnesses when they came to my door. Though I had just moved to Germany and just begun to study German, I knew what they were saying. "Bible" is the same in German and English and I knew the word for the verb, "to read." Also they were Jehovah's Witnesses. They weren't there to borrow sugar. I understood. But I lied. "I don't understand," I said. "I'm sorry. I only speak English." It was a great excuse. A week later, two more Witnesses came to my door. "You want to read the Bible?" they said. "You want to know God's plan for human happiness?" Of course it was. As a religion that prioritizes proselytization, Witnesses put tremendous effort into reaching people who are different than themselves. They translate their message linguistically and culturally. 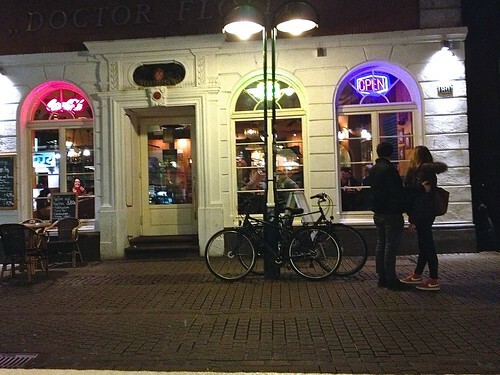 They don't expect to be accommodated in conversation; they accommodate. There has been much theorizing under the heading of "post-secular" about the problem of religious participation in public discourse. For the religious to speak to those who do not share their ontological presuppositions, it is said, in public discussions in pluralistic, democratic societies, it must be necessary for there to be a reformulation of religious arguments into publicly accessible, this-world terms. This is a very literal case of that problem. Yet it illustrates, if nothing else, that there might be a problem with framing the matter of religious people dialoguing with those who do not share their religion as a "problem." Read the full essay, "Habermas and the Problem of the 'Problem' of Religion in Public Discourse," at The Religious Studies Project. As Hurricane Sandy bore down on the East Coast with winds of 100 miles per hour, power lines went down and, like the flip of a switch, New York City's lights went out. Neil deGrasse Tyson, perhaps America's most popular promoter of science today, gathered his family in their dark Manhattan apartment. Recalling the moment from 2012, Tyson said he read from the beginning of the book of Genesis "to fill the spirit of the air." It's an example, he said, of how he doesn't conform to the popular perception of an atheist. It's an example of how he doesn't fall in line with New Atheists like Richard Dawkins and Daniel Dennett, or fit with the atheist movement, as a movement, even though parts of that movement have actively tried to claim him. Tyson recently went on a podcast devoted to skepticism, Rationally Speaking, to talk about that "land grab" to claim him ideologically for atheism, and why he resists being called an atheist. Steve Hill, Pentecostal who preached at the Brownsville Revival, in Pensacola, Florida from 1995 to 2000, has died of cancer at age 60. Papal-branded alcohol, local to Tübingen. 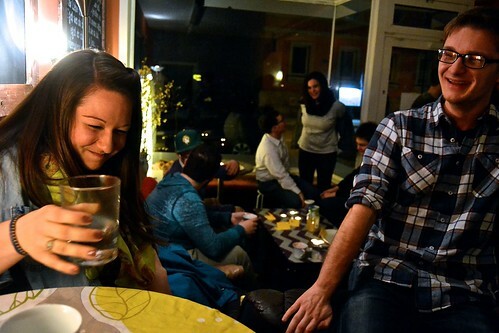 Pope Francis has a Walnut liquor, while Pope Benedict has the much stiffer drink, a 40 proof schnapps. The name of the retired pontiff's drink puns his name before he was pope, Ratzinger, with the name of a popular brand of German schnapps, Ratzeputz. Josef Ratzinger once taught at the University of Tübingen and it is believed the chaos of students protests in the late 1960s prompted his lifelong conservatism. 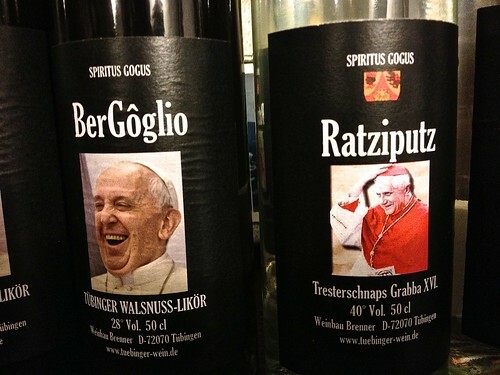 The current pontiff's liquor puns his family name, Bergoglio, with the local Swabian slang word "Gôg." This refers condescendingly to the inhabitants of the lower part of the city of Tübingen, historically the university town's underclass. Roughly translated, "townie." In the late 1890s, author Herman Hesse said the Gôgen were drunk men, slovenly women and naughty children, all of them thieves. They, like Pope Francis on the label of "BerGôglio," likely laughed at that. Both papal liquors are available only in Tübingen. American evangelicals' conflicted relationship to cinema is not new. Anxieties about being co-opted are, in fact, perennial. "Remember that we have been here before," wrote Tim Challies, pastor of an evangelical church in Toronto, criticizing the hype around the most recent life-of-Christ film, "Son of God." "Remember that there are a lot of people hoping to make a lot of money from this film. Remember that God promises to bless the preaching of his Word, not the display of that Word on the silver screen." It is, for sure, a familiar space for evangelicals trying to be culturally relevant without being basically suckered as indiscriminate consumers. There's precedent for this discontent. Jehovah wrote commandments on stone, so they could not be erased; he proposes to write them on the human heart. Hollywood has inscribed them on on celluloid and sound tape, somewhat more brittle and breakable. When God speaks in a Hollywood accent, it is somehow easier to swarm box offices than to storm the altars of repentance. It was, notably, the evangelical magazine's first film review. The author David Foster Wallace seemed to seek after something religious in his work and in (parts of) his life. From a certain angle, his writings appear like theological explorations, the existential and epistemological themes opening into themselves to become deeply anxious ethical questions. Wallace asks, How can you be a good person when you always feel like you're the smartest in the room? His answers -- honesty and sincerity, awareness, paying attention, being humble -- have moved many. Certain sorts of precocious young men, in particular, who are also beset by the arrogance that's a half-functioning defense against an aloneness that finds justification in the post hoc explanation, "I'm smarter than them," find it moving. It can seem a way out. It can seem a way out, most of all, of one's own loathsome labyrinthine self. What strikes me as absent from Wallace's essays isn't sincerity or even necessarily optimism; what's missing is faith. Wallace was narrowly correct in saying that we're all marooned in our own skulls, and that we ultimately have to make up our own minds about things. But most of us draw a line where Wallace couldn't in his interview, just before 'true empathy's impossible.' If by 'true empathy' Wallace means total inhabitance of another's inner workings, then yes, true empathy is impossible. But most of us don't go there. In order to get along in life, we put our faith in the good will of people we love, or in higher beings, or in the rule of law, or in inspiring public figures like John McCain and Barack Obama. Some of us even put our faith in literature. This is the real tragedy of Wallace's conservatism. That conclusion may depend on mistaking the beginning for the end. To be trapped in one's own skull is not meant to be the final state, but the starting point. That's the point from which, for Wallace, one can overcome narcissism, solipsism, the prison cell of self. The trick -- if that's not too cavalier -- is to note that one is marooned, and then that everyone else is too. The isolation of the mind is a shared condition. Thus, in isolation, one isn't isolated. The weekend box office results are in and "Son of God," depicting the life of Christ, earned $26.5 million. The film was showing on 3,260 screens in threatens across America, with an average of about $8,000 tickets sold per screen. About $9.4 million of tickets were sold the first day, according to Box Office Mojo. Nearly the same amount sold on Saturday, but then on Sunday sales slipped to $7.8 million. Those numbers will likely please the producers of the film, since they're about what was expected. One internal projection reportedly put opening weekend sales at $22 million, a bit below actual sales. Another projection put sales a bit higher than they actually were. If 5 percent of self-identified Christians bought a ticket, that would rack up sales of about $30 million. "Son of God," it would seem, did as expected on the movie market, bringing in $26.5 million. Those numbers are also better than a lot of other recent religious movies. The evangelical film "Courageous," widely thought of as a success, opened its first weekend with only $9 million in ticket sales. Of course, that film did not receive as wide a distribution as "Son of God," and was only shown on 1,161 American screens. Fox, however, has been pushing its religious films more aggressively than other studios and giving them wider distribution. The company has made a concerted effort to, depending on how one thinks of it, either reach or cultivate a conservative Christian market. "Son of God" is part of this. It is also being widely distributed by Fox, and the studio is seeing results similar to its other efforts. Against formidable odds and with dubious financials, Ark Encounter LLC has raised sufficient funds to start building a 510-foot replica of the most famous boat in the Bible. Ken Ham, the young earth creationist behind the project, made the announcement last week, in an online video presentation. After more than three years of planning and some delays, the construction of the ark is about to begin. Groundbreaking is scheduled for May and the new museum and 800-acre park in Williamstown, Kentucky, 50 miles south of Cincinnati, could have its grand opening as soon as 2016. "Other than the cross, I believe the ark of Noah is the greatest message, the greatest reminder of the message of salvation," Ham said in the announcement. "The funding is in place for Phase 1 to begin, the construction of the Ark Encounter project." Details about the funding are still vague, however. It is unclear how much money has been raised for the project, which is estimated to cost over $120 million before completion. Neither Ham nor the vice president of advancement, Joe Boone, nor anyone else at Answers in Genesis mentioned specific dollar amounts. In addition to the usual fundraising strategies, the Ark Encounter, which is organized as a for-profit corporation, is being funded in some unorthodox ways. In cooperation with the city that will be the site of the future museum, the corporation has offered $62 million of junk bonds to potential investors. One unanswered question is how much money was brought in by the sale of junk bonds. If you're not one for religious services, Saturday is as good as it gets. If you are planning on going to church tomorrow, though, a Gallup study shows that you will enjoy your Sunday a lot more than your non-observant neighbors. Sleeping in is apparently not as enjoyable as one might think. Not only do Americans who attend a church, synagogue, or mosque frequently report having higher wellbeing in general, but they also get an extra boost to their emotional state on Sundays -- while the rest of Americans see a decline in their mood. The average number of positive emotions frequent churchgoers report experiencing rises to a high of 3.49 for the week on Sundays, whereas for those who attend church monthly or less often, the average number peaks on Saturdays and declines to a range of 3.14 to 3.29 on Sundays.